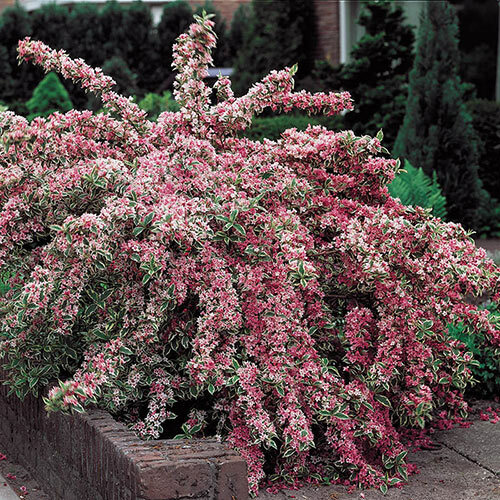 Pink Splash Variegated Weigela | Gurney's Seed & Nursery Co. Graceful, arching branches display a multitude of pink and white funnel-shaped blooms in the late spring and again in the fall. 4- to 5-ft. tall shrub with green and cream variegated foliage does best in full sun to partial shade. Irresistible to hummingbirds and butterflies. Potted. Zones 4-9. FoliageNew growth is soft medium green, broadly edged with creamy white. Leaves are oval, toothed. Mature color is dark green in the center with lime green margins. Flower Form1-inch Foxglovelike flower, funnel-shaped in lower half, bell-shaped above with 5 spreading petals. Soil RequirementsWell-drained, average soil. Not too dry. PruningPrune to shape or to remove dead and broken branches. After flowering. CommentsPink Splash Variegated Weigela is so vibrant and colorful that there is no denying its abundant beauty. This showy shrub will add pizzazz to your borders with its charming deep rose blooms and elegantly etched green and white foliage. DepthSet plant at the same level it is growing at in the container. Firm soil well and water thoroughly.